Our company began with a simple idea. 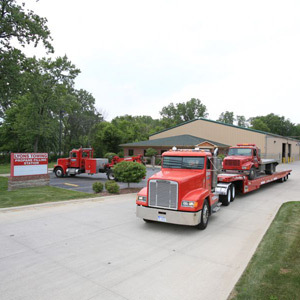 We felt that customers deserve the best towing service around and, in 1960, we opened our doors to the public, providing towing and vehicle recovery in Southeast Michigan. Though we started off small, we were determined to grow the business one satisfied customer at a time. By focusing on providing excellent service, as well as cultivating lasting relationships among our clients, we believed we could grow to become a company our customers relied on. Now, more than fifty years later, we are still honoring that simple but important vow: to treat our customers with care and respect. While we have grown in size and customer reach, our principles are the same. Each customer who walks through our door or calls our number is a person we value. We show our appreciation for our customers’ loyalty by delivering the very best in towing and recovery at prices that reflect our family values. We are privileged to continue to operate Lyons Towing as a family business and treasure the relationship we have developed with the Southeast Michigan community. When you call our business, you can rest assured we will listen to your needs and deliver prompt and reliable service. Our technicians are experts in the field of towing, recovery and transport and share our values of customer satisfaction. Whether you have transport needs or need emergency recovery in Southeast Michigan, you will be greeted by a friendly worker who will take the time to discuss your needs, explain your options and provide the very best in service. Call us today at 734-676-6333 and find out why, after five decades, our customers still count on us.